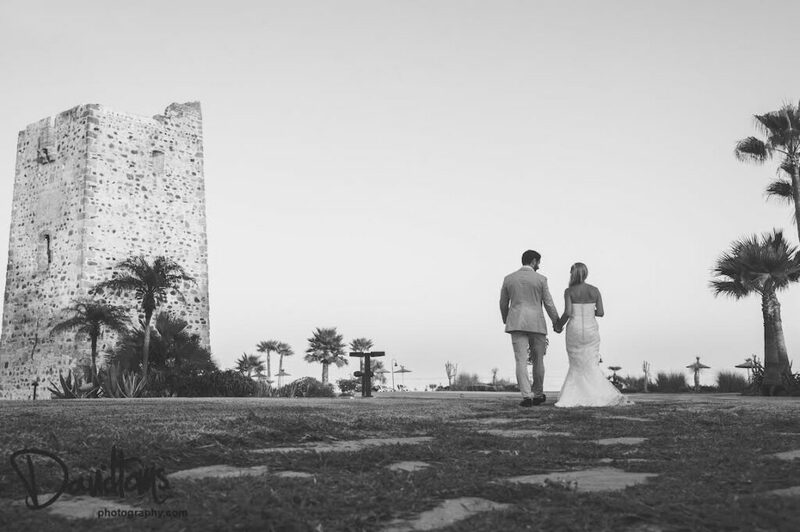 In part one we joined Joe and Ashley on their wedding day at our stunning Marbella Beach Venue. The weather was glorious, the outdoor ceremony was beautiful and the musical tone for the day was set early with the bride walking down the aisle to live music by our wonderful singers. Joe and Ashley’s vision for their big day was to have live music and a great family get together from start to finish…and the fun had only just got started. After the ceremony, friends and family were led up across the lawn to the sea-view terrace where singer Zoe and musician Damian performed a jazz set during the drinks reception. Guests had a choice of drinks including Tinto de Verano (a favourite drink made with red wine and fizzy lemon – the perfect tipple for summer). Guests enjoyed the music while sampling wonderful canapés including Bruchetta of prawns with sweet chilli, mini crab rolls, smokes salmon and cream cheese tartlets and the traditional Spanish dish of ham and cheese croquettes, to name a few. After the photos had taken place the guests were led in to the Marbella beach venue’s airy interior and were seated, and Joe and Ashley stepped into the restaurant to Zoe singing ‘Ain’t no stopping us now!’ – and how right they were. Everyone enjoyed a sumptuous meal of Goats cheese or King prawn salad, a choice of Lamb Chops or Oven Baked Cod and tempting desserts of Strawberry Romanov or everyone’s favourite, Chocolate Brownies. Then it was time to cut the cake…something that all the kids had been eyeing since the start. The cupcake tower was a picture of prettiness and once the main cake had been cut it signalled the start of the bar reopening and time to dance! Then as the sun set over the sparkling sea, guests gathered inside and the twinkling lights came on in time for the couple to step on to the dance floor for their first dance to the love song of the year, ‘Thinking Out Loud’…which was made even more special when they were joined by their beautiful children. So, in true Essex and London style, Ashley and Joe brought Marbella to life with a truly spectacular finale to their day. Drinks were flowing, friends and family piled in to the hilarious photo booth and then guests partied the night away to a star performance by the enigmatic Cuban performer Yanela, followed by a cool set by DJ Fuller and the enigmatic electric violinist Quike. Their day was all about family and fun, and guests were even treated to a live rendition of ‘Let It Go’ by their eleven year old daughter. Joe and Ashley wanted a night of musical entertainment and that’s exactly what they got. And when you have a Marbella beach venue wedding, the best things in life are always free – dancing, sunshine and plenty of fun!